There are lots of ways to look at the weekend’s incidents in Chicago, which resulted in six hit batters, four ejections, an in-dugout apology, some strategic rethinking about ages-old Code courtesy that’s long been questioned but never usurped, and a one-sided war of words waged by Cubs manager Joe Maddon. That became clear on Saturday, when Cardinals second baseman Kolten Wong was hit twice (angrily spiking his bat after the second one, from reliever Fernando Rodney; watch it here). After warnings were issued, Cubs closer Hector Rondon furthered the tension by drilling pinch-hitter Greg Garcia to open the ninth, earning ejections for himself and Maddon. “Obviously, we’re not trying to [hit anyone],” said Maddon, after the game. Well, no. Not so obviously. The denial of any intent for any action that can be justifiably read as antagonistic is part of the Code. But even were Maddon telling the truth, he had to realize that the chutzpah involved is overwhelming. Actually, he did. Rondon drilled Garcia with a 96-mph fastball while his team held a four-run lead. Rodney is already known to go after people. It’s easy to explain away any one of Chicago’s three drillings that occurred after Maddon’s promise to “finish stuff,” but such blanket whitewashing is a stretch. Perhaps it’s an indication that the Cubs are growing up as a franchise, that the mighty Cardinals finally see them as a threat and are responding in kind by breaking out big-boy tactics. It wouldn’t be a first. Chicago’s newfound success can be seen in Maddon’s own strategies; with his team in the heart of the wild-card chase the manager made clear his intention of placing the unwritten rules in a secondary position to winning games. In the eighth inning on Friday, he shut down his running game despite the Cardinals opting not to hold runners on first, on account of Chicago’s five-run lead. Maddon ended up having to warm up closer Hector Rondon in the ninth, on a day he would have liked to rest him entirely, and made it clear that he regretted the decision. Sunday’s series closer featured no big leads for either team to exploit. It also featured no hit batters. For those of you scoring at home, it was the final time during the regular season that these teams will face each other. 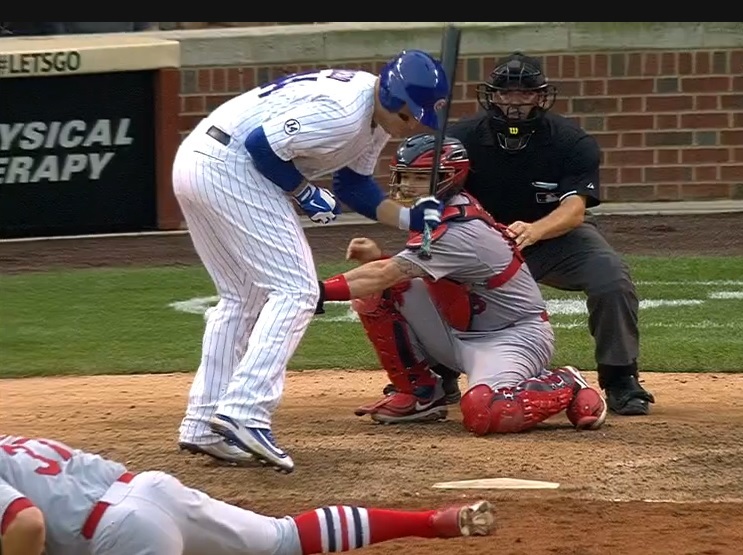 So be sure to mark your 2016 NL Central calendars for some quality Code-based action.